5” x 7”, 216 pp., illus., pb. Chrysalis Tarot opens up your psyche and illuminates your path toward personal destiny. I have been patiently awaiting the publication of a companion book to the Chrysalis Tarot, and I am incredibly pleased with what has been presented to the Chrysalis Tarot reader. What I found through the Two Parts of this guide was the heart and mythology of Chrysalis Tarot. The voice of the book weaves origins of imagery, sensation and the soul of what makes Chrysalis Tarot work. After Toney Brooks invites you to journey onward through his thoughtful Introduction there is a dynamic Foreword, written by the enchanting Tali Goodwin. Her passage is illuminating and indicative of the harmonious tone of masterfully composed pages, written by Holly Sierra and Toney Brooks. Holly Sierra was gracious enough to share her early sketches of every single one of the 78 cards in the Chrysalis Tarot deck. She continues with anecdotes about her process and/or what the creative duo went through to accomplish the final result of the images we use today. Toney Brooks defines the nuance, emotion and purpose of these characters some of us have come to know. What I most enjoyed about this book is the fact that, as you read on, it feels as though you are sitting at tea with Holly and Toney, as they describe these many friends of theirs. The chat carries on to express the various attributes and way in which these friends may assist you in your everyday life. After reading this book, I felt as if I had met Chrysalis Tarot's family. As if I was privy to baby photos and stories of childhood milestones, and I fell in love all over again. I highly recommend this book. It has everything you are looking for in a tarot companion. I believe in, what I call, The Chrysalis Tarot System. This book will help you navigate through using the deck, of course. However, it will also help shed light along your path. I love the Chrysalis Tarot but having this book to refer to has really helped me develop a deeper connection with the cards, which I use in my daily morning reading. I found that the little book that came with the deck just wasn't quite enough but this book gives more depth of meaning and explanations of the origins of each card and that has really helped me make a better connection with the deck. Thank you. I'm a huge fan of the Chrysalis Tarot: the artwork is magnificent, the symbolism and energy of the cards are truly unique. I don't think there is a better Tarot deck out there as a tool for personal growth and for gaining deeper insights on our journey. Don't expect a "standard" book with defined and/or classical meanings of the cards (this is not a standard Tarot deck neither ;-)) The Chrysalis Tarot invites you to work with your imagination, to trust your intuition in giving your reading a personal interpretation ; by doing so, it definitely stimulates the connection with your Higher Self. One of the many reasons Chrysalis is my favourite Tarot deck, is that each card and each explanation in the book provide a positive outlook. It matches my personal conviction that we can't always choose what happens to us, but we do always have a choice in how we will react on things. And there's always a way to approach events in a positive way, to learn from what's happening to us and how we evolve. Toney Brooks does so much more than just "explaining the cards" and their meaning: you get fantastic shares about quantum physics, shamanism, mythology, etc. Another thing I love about the book is that Holly Sierra introduces each card with some insights on why & how she created the card. Overall, each card is discussed equally in the book: Majors, Minors and the Court cards get the same attention. IMHO: this book is a must have if you like working with the Chrysalis Tarot or would like to get acquainted with it! What a FANTASTIC adventure! This book really is a "companion", both to the cards, and to your life! Having quickly read the introduction before shooting off out I was already hooked & couldn't wait to get home to read more! The layout is great, interesting chapters about all things mythological & metaphysical, based around the key "Characters" in the journey, followed by "The Hero's Journey" itself, an in depth guide to each card, complete with original sketches and the story behind the card, what inspired the design etc, right down to little details, like why there is a teeny Mouse in the corner, and why The Sun has a teardrop (no, "He" is not sad)...All these little things add to the thrill of the adventure and stay with you, lodging themselves in the memory bank to come jumping right back into your head when you then look through the cards! I read through the whole book before spending much time with the cards and didn't want to put it down! By the end of it I felt like I'd been on a journey & met some wonderful characters.....Just wish there was a sequel! I've been reading my Chrysalis Companion book, well like its a new companion. I love this book! I've especially enjoyed being able to pull case studies of cards, and draw deeply from the reservoir of knowledge and myth presented within these pages. This has allowed me to deepen my own intuitions through understanding more of the correlations and associations with cards that come up regularly in my daily readings. Having this book to make quick references between the cards, opens the opportunity to study my own connections and patterns, and become more conscious of the synchronicity presenting in my life. Additionally, this book has inspired me to spend time with my cards in a new way! Studying each card in new context and themes, one by one with each turning page. 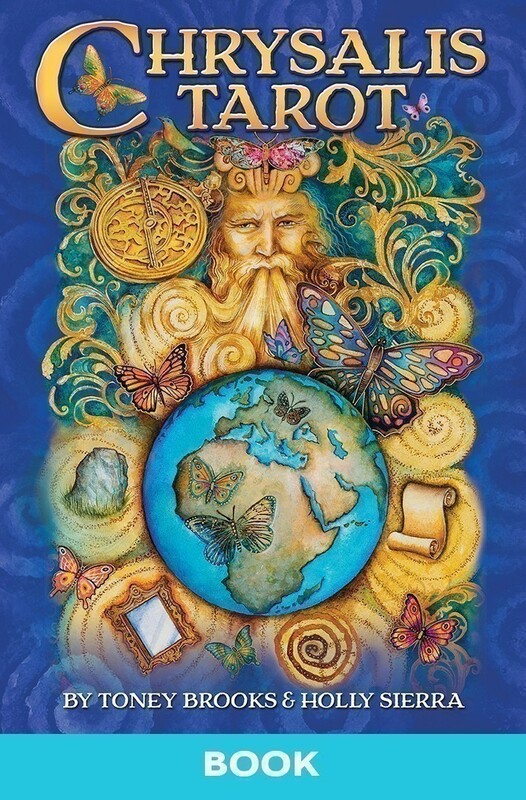 The Chrysalis Tarot Book is a valuable study guide and reference book for its deck and for understanding the metaphysical world behind it. I love the golden thread woven through this book with art and storytelling, that truly makes a connection through the heart chakra and draws you in closer to relationship with the book's wisdom and maybe more importantly, your own.